The vast majority of my maps over the past two years were drawn at slightly above half-page sizes. I mostly used notebooks and sketchbooks that were an appropriate size to carry around in cargo pockets, so nothing exceptionally large, and definitely not close to the classic letter or A4 size page. Since this year began however, I’ve started working a lot more with full-sized pages, which means a lot more time spent on each map. City maps in particular take a lot longer on a larger page. I’m glad I cut my teeth drawing city maps in my sketchbook otherwise I would never have found the stamina to go through with full page city maps. 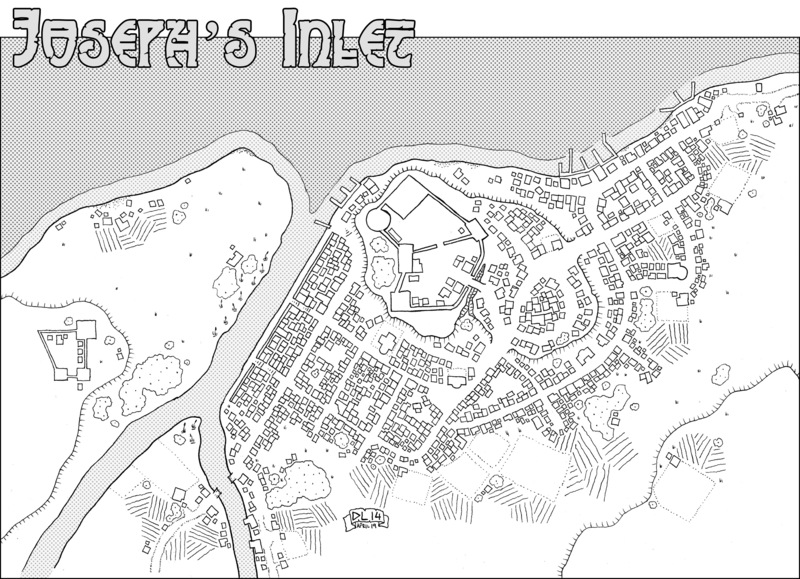 Joseph’s Inlet is one of three full-page urban maps I’ve drawn in the past month (the other two were for commissions, although one of them I’ve already stolen for use in my home games too). Joseph’s Inlet has a few features that I wanted for a few stories / adventures. Some fantasy novel I had read in the past year had a section of town down by the river with a large retaining wall blocking the houses from the river front. You can see that wall (with two streets with stairs that break through the wall) along the river front. Boats moor along this area, and the town watch keeps up regular patrols here (particularly at night) to keep the transient population from causing too much trouble with the locals (or vice versa in some cases, keeping the boat crews from falling victim to local cutpurses and con men). There are two markets in town where vendors set up stalls and tents to sell goods – one on the plateau east of the keep, and the other (larger market) almost due south of the keep. Everything else? Well, that’s up to you! Joseph’s Inlet was drawn using a Sakura Micron 005 pen on 8-quad graph paper. It was scanned, contrast-enhanced, and had a bit of post-production (screentones for the water, frame, title) done in Photoshop. 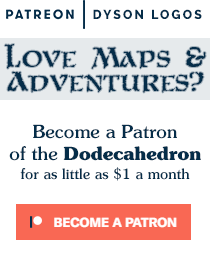 It is made available for your free use thanks to Keith Senkowski, Steve Hyatt, Parker Hicks and the rest of the incredibly awesome patrons supporting the Dodecahedron through Patreon.